Parents and students at Sisson and Mount Shasta Elementary have asked for better school lunches. Lunches that include fresh, additive-free, non-gmo, organic (when possible), delicious whole food. The problem was, we didn't have our own school kitchens. We relied on food being delivered from another school kitchen in another city. The problem seemed too big to solve. 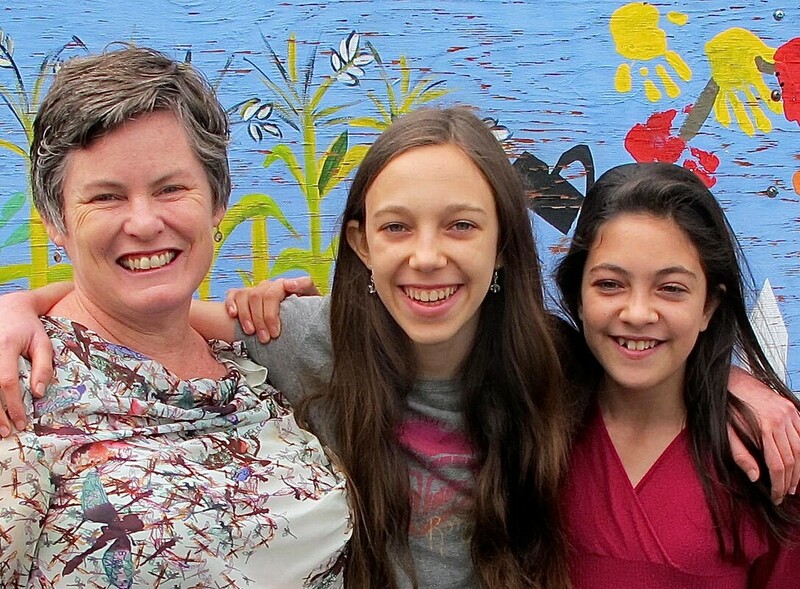 Two students (Maya and Ella) continued to ask their family for better school lunches. Only 40 % of the students were eating the food at school. They were told they had a choice in this matter; to try and fix the problem. Next thing you know Maya had created a proposal outlining a fresh, tasty, organic, whole foods solution! 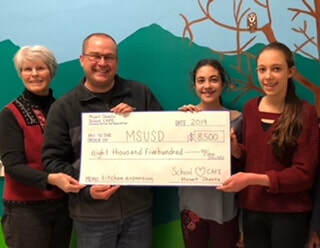 Wayne Kessler, a supporter of this youth led project, prompted Maya to present her idea to the Board of Trustees of the Mount Shasta Union School District. At the December 2016 meeting of the Board of Trustees of MSUSD, Maya, at that time an eighth grader at Sisson School; presented a paper making a case for improving the taste and nutrition of school food. They apparently liked what she had to say :-) because this youth-led project inspired the Board to create a Superintendent's committee designated as the School CAFE (Culinary Action for Education). The committee consists of students, parents, Board Trustees, the Superintendent, school employees, and you! The fiscal sponsor is the Mount Shasta Bioregional Ecology Center. Become part of a movement for healthy school meals in Mt. Shasta and help students to have fresh, highly nutritious, wholesome food. ​If you are interested in being a part of this wonderful program you are welcome to contact us. Our goal is to be independent and provide nutritional food for our students in our own kitchens. To provide healthy food that our young people like to eat. Food that grows strong bodies, bright minds, and balanced emotions. To bring the community together to ensure healthy meals for Mount Shasta Union School District students and to provide an understanding of and an appreciation for real food that is delicious, local, organic, and fresh. Maya and Ella went door to door in 2018 collecting donations from local businesses. They kept their intention and hopes high and met with most businesses in the downtown area of Mt. Shasta. Amazingly, they collected nearly $10,000! The School Board voted on February 19, 2019 to discontinue food service with Weed School District and to establish this district’s own meal program based around salad bars and a hot main dish for lunch. ​This is a win! We are well on our way to realizing our goals. On the 28th of February 2019 a check for $8500 was presented to the School Board to add to the budget for our new kitchens. We are so proud of these young people and the support they have inspired. 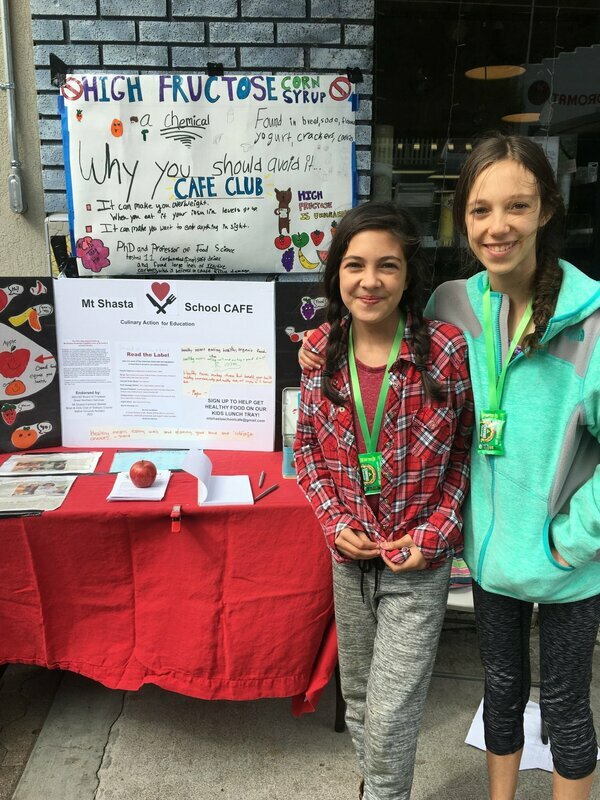 We feel the news of the support from the School CAFE team and local businesses convinced the school board of our sincerity and persistence in bringing healthy food and nutrition education to the community. The students are learning about successfully working with each other, community members, school board trustees, and teachers and sponsors. They are learning how to plan and prepare and to implement their ideas. This experience is so valuable. School CAFE Mt. Shasta, California 96067 © COPYRIGHT 2019. ALL RIGHTS RESERVED.